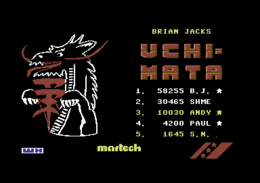 Information Alternative names: "Brian Jacks Uchi Mata" and "Judo Uchi Mata"
7.30 points at 10 votes (rank 259). 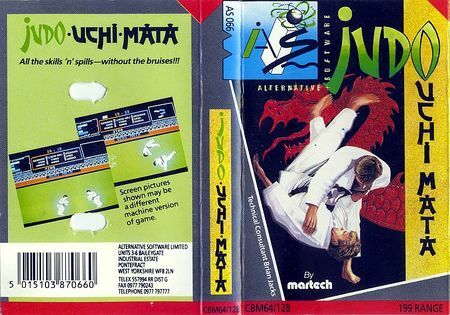 Uchi Mata is a very realistic and contemporary realisation of the Japanese fighting sport Judo, which nowaday serves for self-defence. Since the 20th century this sport has become known and famous world-wide, so that today many international sports Judo tournaments are carried out. Since 1956 there are Judo World Championships. Since 1964 Judo is an Olympic discipline (with disruption). A Judo match is carried out on a judo mat between 2 persons. Hereby blows and kicks are forbidden. It is allowed to use clever fighting techniques to hold the opponent at bay or throw him on the mat. The manual contains a foreword from the Briton Brian Jacks (7th Dan), who has won different national, European and international judo competitions several times. The judo fight is carried out as an indoor sport on a green mat. The sprites of the two fighters are rather big. The course of a fight is fluent. In the background you can see an audience interested in judo, as well as the fighting time running out, the points you made and other details about the fight. Bars in the colours of the judoka show current stamina (STAMINA) and the advantage with the grip (GRIP) at the left. The monitor to the right informs about foot positions and decisions of the referee. To the left and right of the time display, you can see white or red rectangles (corresponding to the karate uniform) lighting up as attack indicators. In the lower line of the screen the currently used fighting techniques are shows, as well as further information about the tournament. Before the fight, the judoka show each other respect. 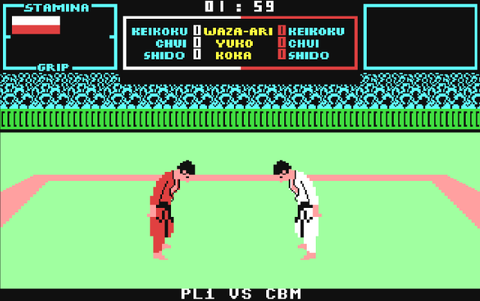 A player (PL1) controls the judoka in the white suit with joystick port #1. The other player (PL2) controls the red fighter at port #2. 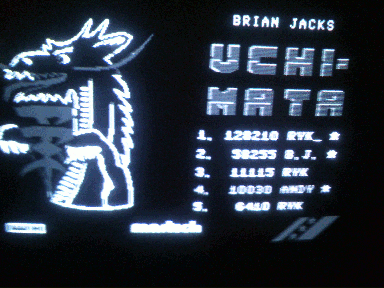 The game switches automatically from the title screen to the demonstration mode (DEMO). Two computer fighters show their abilites until one of the following possibilites is chosen. In the judo sport, the aim is to win the match with the evaluation Ippon by using perfect techniques. The most important criteria for a perfect throw in judo are: control, power and speed. 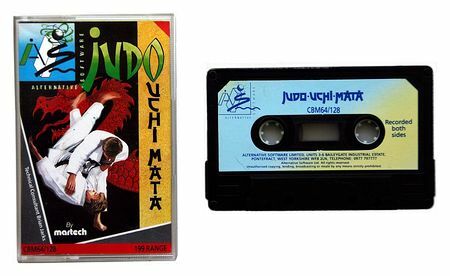 In the game, you try to win as many judo fights as possible, to enter the highscore with the highest score as possible. As common in judo, the first step in the fight is an optimal grip at the opponent's clothes. For this you get close to the opponent and press the fire button at the right time. The faster you have pressed the fire button, the better will your grip be and the higher will your GRIP display be. A good grip is the prerequisite for a successful throw. To start an attack press the fire button and keep it pressed. When the GRIP and STAMINA values are good enough, the attack indicator will light up in your own colour next to the match clock for some moments. You can only start an attack as long as the indicator is visible. The course of the different techniques is listed below. ...and also the AI likes to do Hansoku. In Uchi Mata the referee gives different votes with hand signals, as in a real match. The referee icon appears white or red, corresponding to the clothes colour of the benefited. The central score board shows the votes that were already achieved. Votes for the white judoka are on the left, for the red judoka on the right side of the board. As the game does not contain any hold, lever or choking techniques, all the votes refer to throwing techniques. If the vote Ippon is given, the match ends and the thrower has won. You get Ippon for a perfectly done throwing technique that forces the opponent to lie on the back. Further possibilites in the game to get a victory by Ippon are to win a second Waza-ari vote and the disqualification of the opponent. A half point is given, when not all throwing criteria are perfect, so e.g. when the thrown opponent lies only partially on the mat. Two Waza-ari given one Ippon score and this the victory for the thrower. Yuko scores are not added. Koka scores are not added. On the Uchi Mata score board you can find the now obsolete system of admonishments which differed between Shido (cautioning, -3), Chui (small punishment, -5) and Kei-Koku (admonishment, -7). These gradations that are not used any more today are, however, not considered in the game. Each breach of rule is punished with an instant Hansoku-make (disqualification) in Uchi Mata! Note: The smalles score used in the game, Koka, was repealed in 2009 and is not used any more in today's competitions. Breaches of rule are punished with a so-called Shido (admonishment). With more than three admonishments the final penalty Hansoku-make (disqualification) is given against the unfairly fighting judoka. For severe breaches of rule a Hansoku-make can also be given instantly. Hansoku-make corresponds automatically to the Ippon victory of the opponent and usually leads to an exclusion from the competition for the disqualified. Keep in mind: A Hansoku Make instantly makes you lose the fight. Use the joystick targetedly only for your techniques. Above all, avoid left-right-left movements in an attack. Keep in mind: Every opposing throw can be the immediate end of the fight. Learn the defence techniques and counter every opposing approach for a throw. If a throw cannot be avoided make a circling movement with the joystick to avoid landing on the back. Specialise to simple, working throwing techniques. Learn to get a good grip. There are no cheats known. TheRyk: "The developers really did a great job in terms of creating a Judo game. Graphics are alright, sprites are big in a good way. The animations are well-done and the Eastern music matches a Japanese martial arts game really well. Little is missing for perfection. Though it's fun to try all the moves, you need only a small repertoire to play successfully and avoid Hansoku-Make. That makes it slightly too easy, as the AI plays a little more risky. All the fancy displays in the top third of screen are also somewhat over the top - considering you ain't got much time for looking at them and you are none the wiser from these dancing step instructions displayed at any move, anyway. However, a top game, 9 points." This page was last modified on 3 April 2019, at 00:38.